I'm off to the family lakehome and should probably be packing instead of blogging but I wanted to quick post a photo of the rose I did last night. 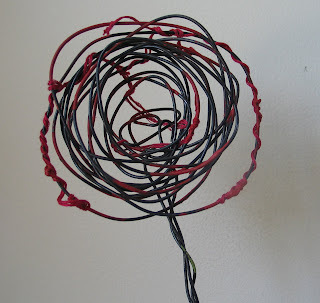 I mentioned a few posts ago trying to hand paint the wire flower forms I do- so here are the pics! I'm trying to give the flower a bit more mixed media, artsy, and graffiti feeling to it. I think the paint seemed to add to the sketchy feeling as well somehow. Anyways, it's going somewhere and I promise to post more phtotos as it develops. 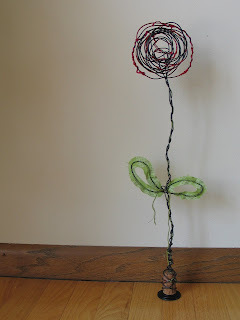 After applying the paint I wrapped the bloom with embroidery floss. The leaves were stitched like usual but then I cut out the center fabric from each. Then I squished the leaf up and frayed the edges a bit. I want to wish EVERYONE who reads this the very best weekend and thanks again for reading!!! Thank you! I really enjoyed checking out yours as well! Love all the colors!!! !